3) Make the servo move! No driver needed, just plug the USB2AX in a USB port and the Status LED should light up very briefly in red then in solid green. The USB2AX should appear as /dev/ttyACM*. The user must be part of the dialout group to have access to the serial port! If the Status LED stays red and the device does not appear in /dev, check that USB Modem (CDC ACM) support is enabled in the kernel. All recent desktop distributions have it enabled by default. If you plan on using Robotis' Dynamixel SDk for Linux, have a look here! Same as for Linux, except the USB2AX will appear as /dev/tty.usbmodem*. Based on a contribution by Sebastien MICK, thanks! If a driver has been automatically installed for the USB2AX, you need to uninstall it completely first. If the USB2AX is plugged in, you should see it appear in “Ports (COM & LPT)”. If the USB2AX is not currently plugged, you need to either plug it in or to show the hidden devices (View > Show hidden devices). Uninstall it: Right click on the device > Uninstall device, check “Delete the driver software for this device” then click “Uninstall”. Unplug all USB2AX devices from the computer. Open the Local Group Policy Editor (gpedit.msc), signed in as Administrator. Run the Device Manager as Administrator. Plug a USB2AX. A new entry should appear in the Device Manager without triggering the automated driver install process. A warning sign should appear next to it to show that it is therefor not functional. Rigth click > Update Driver Software > Browse my computer for driver software > select the driver (.INF file). Voici une procédure pour contourner l'obstacle de l'installation automatique, testée sur un système Windows 10 particulièrement tyrannique. « Normalement », désactiver l'installation automatique de périphériques, dans les paramètres système avancés, devrait suffire, mais dans mon cas ça ne changeait rien. Brancher un USB2AX. Une nouvelle entrée devrait apparaître dans la liste du Gestionnaire de périphériques, mais sans déclencher d'installation automatique de pilote. Le périphérique devrait donc apparaître comme non fonctionnel (petite icône /!\ à côté du nom). Sur la page de l'assistant faisant le bilan de l'installation, un avertissement devrait indiquer que « Le périphérique pourrait ne pas fonctionner correctement ». Et c'est normal, puisqu'on a installé un pilote sans l'associer à un matériel réel ! Dans la liste des pilotes détectés comme compatibles avec le périphérique, une entrée USB2AX devrait figurer. Choisir cette entrée et cliquer sur Suivant… jusqu'à la mise à jour du pilote. Et là normalement, c'est bon. Before the first use, you will need to install the USB2AX.inf driver file (Right click > Save as… to download it). For Windows 8 and 8.1, you need to follow the procedure to disable driver signature enforcement before you can install the driver (ENG / FR). The installation is similar to the one for the Arduino Uno (step-by-step under XP). Plug the USB2AX into a USB port. The Status LED should light up red and Windows might start looking for a driver [Vista, 7]. You can cancel the search, the driver is not on Microsoft's servers. Open the Device Manager. (Start Menu > Control panel > System and Security > System > Device Manager). Here, navigate to and select the USB2AX.inf driver file. Windows will do the rest. If it raises concerns because the driver is not signed, continue. Once installation is complete, the Status LED should turn solid green. This part explains how to connect the USB2AX and make a Dynamixel servo move using RoboPlus Dynamixel Manager, on Windows. Install the driver of the USB2AX, and the latest version of RoboPlus. 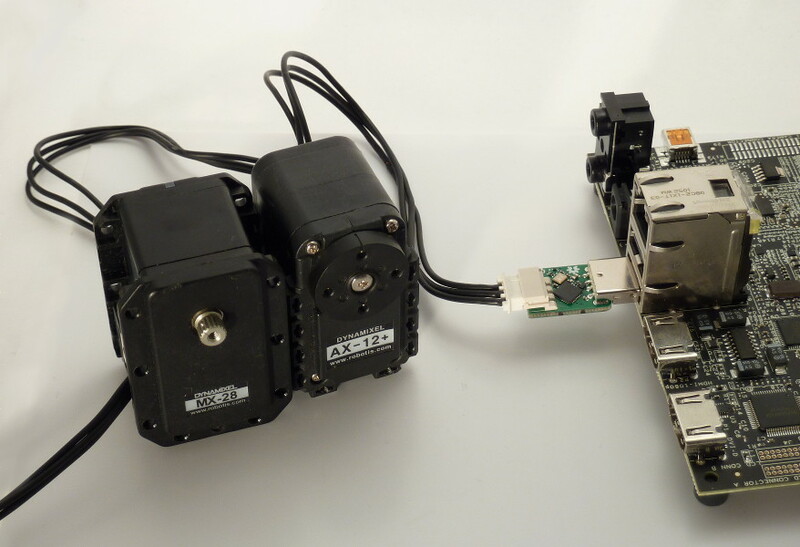 Plug the 3-wire dynamixel cable between the USB2AX and the first servo, and wire-up all other servos. Plug the USB2AX in the USB port, it should appear as a Virtual COM port. Apply power to the servos. Run RoboPlus Dynamixel Wizard, open the corresponding COM port and run “Search” (DXL1.0). You should be able to make the servos move by changing the “Target Position” value.